I suppose I should engage in light-hearted banter this April Fool's Day, but fools conspire to foil my bubbly demeanor. 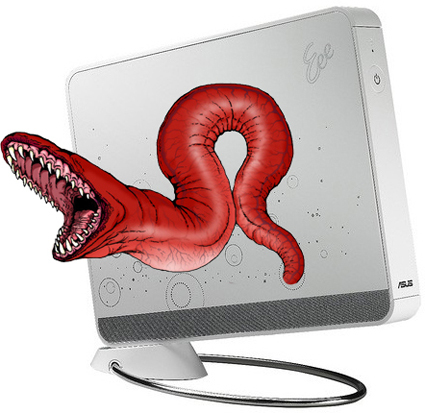 Witness the purported threat of the Conficker worm, poised to strike this day, burrowing through PCs, harvesting user names and passwords and erasing hard disks. We all know what a con is, but what the hell is a ficker, aside from a domain name a web realtor hopes to sell for $4,350 and the surname of an obscure German historian? Sorry, historians and academicians, but Julius von Ficker doesn't ring a bell with me. I am told he "advocated and defended the theory that Austria, on account of its blending of races, was best fitted as successor of the old empire to secure the political advancement both of Central Europe and of Germany." Point to Mr. von Ficker for the blending of races; strike for all that empire talk. Maybe if we imposed mandatory keyboard laws insuring the functionality of our consonants, malicious Mr. Conficker Hacker wouldn't be so darned testy. After all, without the letter L (turning ficker into flicker, for those who aren't following), there can be no Love. "Instead of monitoring volcanoes, what Congress should be monitoring is the eruption of spending in Washington." Which brings us to April Fool's Day and nature's fury. "The waves traveled southward to Hawaii with an average speed of roughly 490 miles an hour, a wave length of nearly 100 miles, and a height in the open sea which is thought to have been 2 feet or less. The height and violence of the wave attack on Hawaiian shores varied greatly: at some points the waves dashed up on the shore with great violence and to heights as great as 55 feet above sea level; elsewhere they rose slowly and without turbulence." Two years later, the predecessor of the Pacific Tsunami Warning Center was established—this day, April 1, forever marks the start of Tsunami Awareness Month. More recently, on March 19, 2009 an undersea volcanic eruption in Tonga generated a five-hour tsunami watch across the Pacific Basin. The death and destruction caused by the 2004 Sumatran Tsunami reminds us that we are at the mercy of geological forces. And not only from tsunamis—according to the Unites States Geological Service, there are 169 active volcanoes in the United States, two of which are now famous, Mount St. Helens and Kilauea (which has been erupting continuously since 1983). The threat from volcanoes is real. In the past 500 years, over 200,000 people have lost their lives due to volcanic eruptions, and an estimated 500 million people will be at risk from volcanic hazards by the year 2000. We're talking earthquakes, toxic gases, lava, avalanches, landslides, tsunamis, pyroclastic flows (remember Pompeii?) and lahars. Word out, Bobby. You lay off my volcanoes, and I'll lay off your hurricanes.